The new Steak House offers a complete menu, featuring prime cuts sure to become a favorite of visitors. Diners in search of an elegant meal after a day at the golf course can choose from seafood delicacies, an array of meat entrees, as well as a Friday and Saturday special that includes prime rib. El Cid Resorts, the luxury resort group for travelers headed to Mexico, has announced that its full-service Steak House at El Cid Golf and Country Club is now open and offering a complete menu that includes an entire lineup of steak and seafood dishes. Diners in search of an elegant meal after a day at the golf course can choose from seafood delicacies, an array of meat entrees, as well as a Friday and Saturday special that includes prime rib. The Steak House at El Cid Golf and Country Club is an ideal choice for vacationers who have spent the afternoon at the sun-drenched Pacific beaches, played a round or two of golf, or just want to take advantage of a top-notch restaurant that is both conveniently located and offers a world class dining experience. At El Cid Resorts, travelers have a wide spectrum of choices when it comes to dining, outdoor activities, shopping, or just lounging next to the pool and enjoying the warm weather. El Cid Resorts is the first choice for discerning tourists in search of famous Mexican hospitality. Those who enjoy the best golf courses in the world are at home on the links at El Cid Golf and Country Club where licensed professionals are always on hand to offer a tip or two, courses are meticulously trimmed and maintained, and a typical round features spectacular views that are not available at any other golf locale. Whether golfers are new to the game or have been playing for decades, the El Cid Golf Academy offers custom lessons and personal attention. 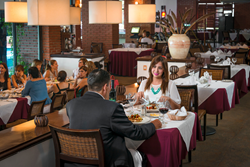 When the golfing is over there is no better destination than the Steak House at El Cid Resorts. Drinks, appetizers, snacks, desserts and a full dinner menu are now offered every day of the week. Different specials will be offered each week but Friday and Saturday will always feature the Prime Rib Special. El Cid Resorts and El Cid Golf and Country Club is the exclusive spot for the very best in golf, resort vacations and fine dining.